The first step in promoting your Amazon listing is to understand what you’re up against. For most categories, you can learn a tremendous amount about what customers want and don’t want based on competitor pages. Additionally, reviewing complementary products regularly can alert you to best practices and promotional opportunities. Analyze competition with the following factors in mind. Customers are very clear on what their preferences are, and often times can lead you to future product enhancements or ideas. Are customers complaining about packaging? How many customers mention price in their reviews? What other products have they mentioned trying in the same category? Move quickly. If you see a competitor is out of stock, that may be a good time for you to lower pricing and increase ads. If you see that competitor reviews are increasing at a faster rate than you, try to figure out the cause. Look for new and innovative ideas such as images or product content from broader categories, and implement them before your competitors. One additional area of competition to keep in mind is against yourself. I have often heard fears from brands that they worry Amazon will undermine their own brand and force them to play the low price game, in turn lowering their prices elsewhere. While every category can be different, for most categories you can create a strong brand on Amazon without having to be the lowest cost player. If you are a premium brand, for example, you may not have to always compete with other brands on price but perhaps by review quality, assortment, availability, etc. In many categories you will notice that the Best Sellers aren’t necessarily the lowest cost options. Solid State Drives, for example, are commodity products that you would likely believe customers would always turn to the cheapest product. 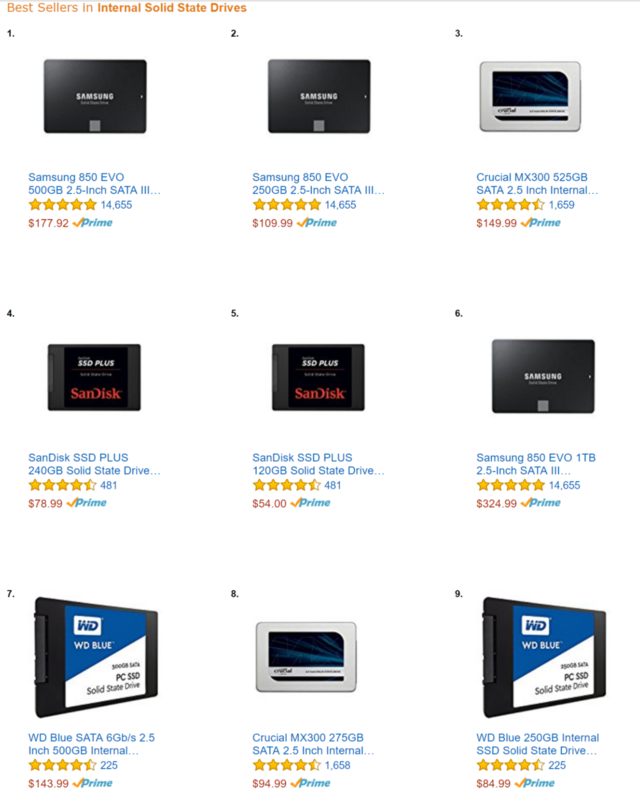 As in this example below, Best Sellers that have built enough reviews and customer trust are able to charge a premium versus other competitors. If you have been selling on Amazon or have started researching becoming a seller, you have inevitably come across the term ‘buy box’. The concept is simple, although the execution to manage it can be much more difficult. 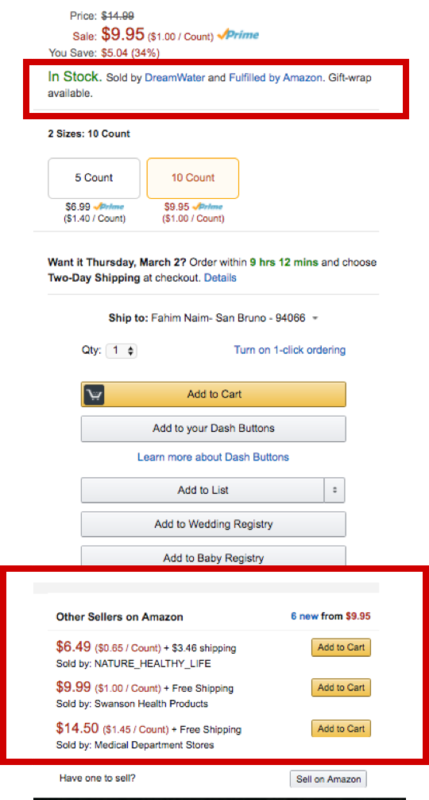 Nearly every detail page has the option for other qualified sellers to also list their offer for that ASIN (Amazon’s sku identifier). So even if you are the manufacturer of a product, another seller could potentially undercut your price on the same item and be the default option on that detail page - or ‘win the buy box’. The exception is for brands that have brand gating, which is extremely difficult to get approved. As you can see on the screenshot below, ‘DreamWater’ is winning the buy box for this ASIN but there are several other sellers listing an offer on the “Other Sellers on Amazon” section. The algorithm for who wins the buy box is proprietary, but the main components are price, prime eligibility, shipping cost, quantity, and seller rating. As you can probably guess, price will have a major impact, but being Prime Eligible and having a high seller rating can sometimes be the difference between you winning or losing the buy box. Technically, each unique product should only have one ASIN (one UPC to one ASIN), but sometimes you will see several different listings for the same product, which is a confusing and frustrating experience for customers. Amazon continues to crack down on duplicate listings and gives Brand Registered sellers the ability to merge duplicate pages, so it’s best to play by the rules and avoid looking for ways to create a separate page with less competition.